Satisfy your inner culture vulture at Tampere Cathedral and Vapriikin Museokeskus. Your inner history buff will appreciate Amuri Museum of Workers' Housing and Hameensilta. 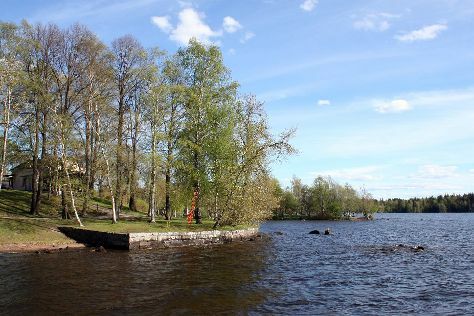 Change things up with these side-trips from Tampere: Ahtari Zoo (in Ahtari), Seitsemisen Kansallispuisto (in Ylojarvi) and Haemeenlinna (Hame Castle & Evo Hiking Area). see Sarkanniemi Theme Park. And it doesn't end there: look for all kinds of wild species at Hatanpaa Arboretum, step off the mainland to explore Viikinsaari Island, see the interesting displays at Motorcycle Museum of Finland, and test your team's savvy at popular escape rooms. To find more things to do, maps, ratings, and more tourist information, use the Tampere trip planner . If you are flying in from Belgium, the closest major airport is Tampere-Pirkkala Airport. In April in Tampere, expect temperatures between 8°C during the day and -1°C at night. Finish up your sightseeing early on the 22nd (Mon) so you can travel back home.